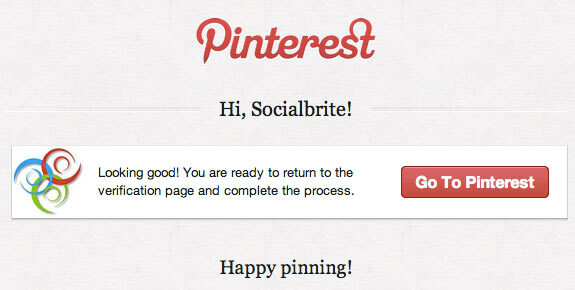 1To begin, log in to your Pinterest account and select Settings in the dropdown under your icon at the top right. Scroll down and click the Verify Website button next to your site’s url. 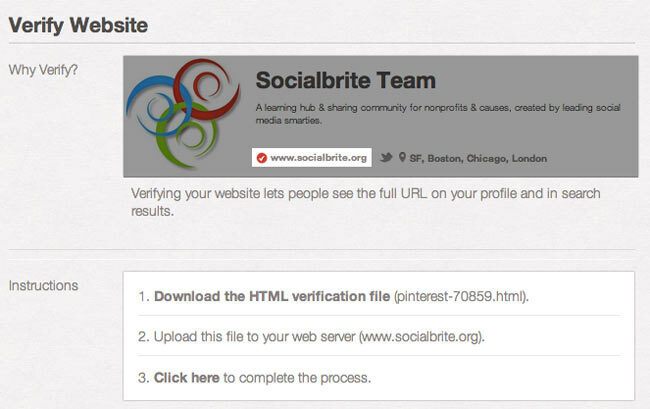 Note that Pinterest only supports verification for top-level domains, like www.yournonprofit.org (or .com, .biz, .net, etc.). 3Return to the same page as in step 2 to complete the process. Click the link that says, “Click here to complete the process.” That’s it! Any questions?JD Lasica, founder and former editor of Socialbrite, is co-founder of Cruiseable. Contact JD or follow him on Twitter or Google Plus.